Believe it or not, it was sort of like Jerry Seinfeld meets heavy metal bad boys Marilyn Manson Fridaynight at the College of Charleston’s Halsey Gallery. 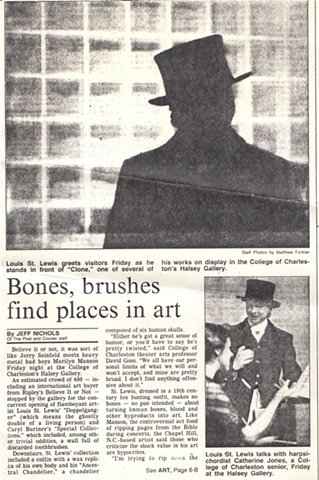 An Estimated crowd of 400 – including an international art buyer from Ripley’s Believe it or Not and The Lady Chablis from The Garden of Good and Evil stopped by the gallery for the concurrent opening of flamboyant artist Louis St.Lewis “Doppleganger” ( which means the ghostly double of a living person) and Caryl Burtner’s ” Special Collection” which included among other trivial oddities, a wall full of discarded toothbrushes. Downstairs , St.Lewis collection included a coffin with a wax replica of his own body and his “Ancestal Chandelier” a chandelier composed entirely of human skulls and bones. St.Lewis, dressed in a 19th century fox hunting outfit, makes no bones – pun intended- about turning human bones, blood and other byproducts into art. Like Manson, the controversial act fond of ripping pages from the bible during concerts, the Chapel Hill, N.C.- based artist, said those who criticize the shock value of his art are hypocrites. Though it’s art with a message, St.Lewis is quick to point out that he doesn’t take it too seriously. Neither should we, he said. Dozens of Charlestonians in the past week including the Bishop of Charleston have called Halsey Gallery curator Mark Sloan to say that St.Lewis’ art is not funny at all. It’s sacrilege, they told him.